Sannakji, sliced raw octopus, is definitely an eye-catcher. Looking at a plate of squiggling octopus parts, many wonder if it is dead or alive. 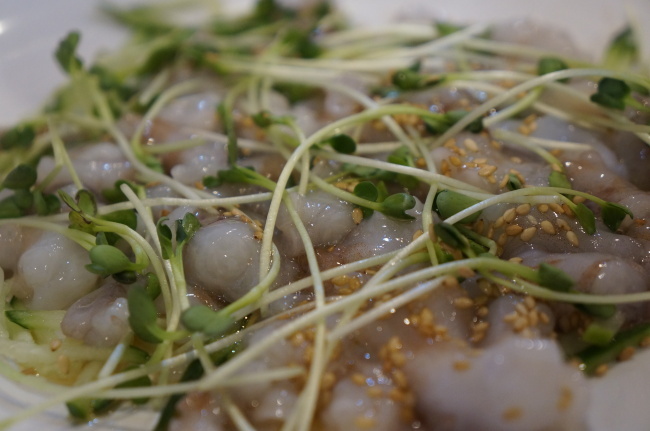 While Koreans love to eat octopus prepared in different ways -- braised, stir-fried and stewed, for example -- eating it raw is also a popular choice. Contrary to the scene in director Park Chan-wook‘s ”Oldboy“ where the protagonist takes a whole live octopus and bites off its head before proceeding to stuff the whole thing into his mouth, the tentacles sticking to his face, sannakji dish is prepared by chopping a small live octopus into many small parts using a heavy knife. It is then served on a plate with a small bowl of sesame oil and a bowl with mixed chili paste, vinegar and sugar, as dipping sauces. By the time sannakji makes its way to your table, it is dead. The tentacles continue to move on the plate because of the continuing nerve activity. One has to be good at using chopsticks to pick up the moving bits of octopus. The tentacles won’t easily surrender, holding the chopsticks tight. Even in the mouth, the suckers cling on to the tongue and the roof of the mouth. Sometimes, the sucking can hurt. The ”very fresh“ ones sometimes even continue moving in the throat. As it has not been cooked, sannakji is very chewy. Also, as it is alive until just a few minutes before being served, it doesn’t have a strong odor. Chewing the wiggling piece of octopus in the mouth, one can appreciate this dish’s exceptional freshness. Video-streaming website YouTube is filled with videos of foreign tourists and expats trying sannakji. In fact, many Koreans recommend this dish to foreigners, considering it an exciting experience. In some regions, sannakji is served whole. Some eat the whole octopus, letting the tentacles get to the cheeks and necks. But it is considered dangerous to eat unsliced sannakji as it could be a choking hazard. Those who are concerned that eating sannakji violates animal rights, may be somewhat relieved to know that the octopus is killed first by maiming the brain before the chopping starts.